Offering Functional, Visible Responsive Web development services including ecommerce, integration, Search Engine Optimization, email marketing, custom code and more. Responsive means it "responds" and is automatically mobile and compatible with digital devices. In addition, Sims Solutions offers digital graphics (vector or high resolution images) for logo, menu design, signs and almost any application. Sims Solutions encourages business's to hire a professional. We offer custom services and can not compete with the $200 or free website template. If you like a template appearance we can mimic the design. Keep in mind you get what you pay for. We provide a Viable and Visible Website with necessary components such as Google My Business. A searchable website works like a giant dot to dot game. The more dots that are connected or connecting continually the better you are in search. Sims Solutions custom web development enables the developer of code to connect the dots. Nobody likes to be boxed in or restricted and that is why Sims Solutions does not rely on a templates. We offer Custom Web Design and therefor we have no limitations. the Internet can offer the first glimpse into a business and first impressions count. Your competition is a simple click away. Sims Solutions has been offering distinguished services since 2004 and strives to earn your trust. We often tell our clients "IF YOU LOOK GOOD THEN WE LOOK GOOD" because your success is a mirror of our success. Click to find the perfect Domain Name and secure your on-line address. Click to find out the rightful owner of your domain or Domain Registrant. Is my information private? Click to find out if your website is mobile friendly. Click to find out if your website is secure? How to set up my email? Want to know your I.P. Address? Does your mobile site load quickly? Click to check the speed of your mobile site. Sims Solutions is honored to work for you and or your company. Although technology changes daily we strive to provide the latest best service and offer the latest and best on-line advantages including Security, Search Engine Expectations and Functionality. We understand business growth does not just depend on a well built functional website but it can be highly motivational. A website offers status and worth to a company. As an entrepreneur of over 15 years we understand the importance of answering the phone and having a personal connection to our clients. Thank you for considering Sims Solutions as your on-line advertising Advantage. We prefer no monthly fees and advice clients to be weary of companies who routinely charge fees. 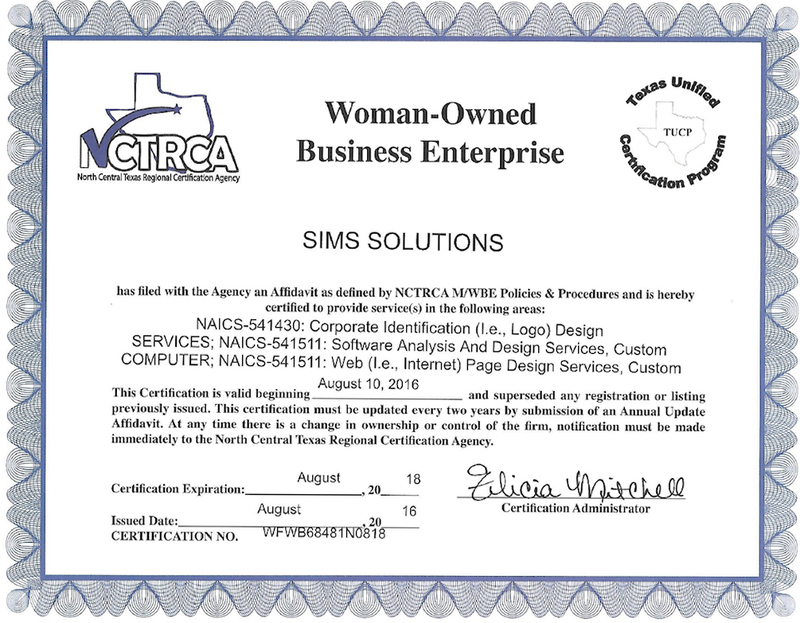 Sims Solutions is a Women Owned Business and a Limited Liability Company. Our Website and Graphic Company is located near Mansfield and Burleson, south of of Fort Worth but is happy to provide website services for any business in the United States. Site Lock / Web Security offers daily malicious scans preventing attacks such as common re-route attacks from the Search Engine side not affecting the actual website but causing conflict to reach an anticipated destination. Business Registration provides more prominent visibility on your domain name's Whois listing by letting you add a logo, business links, images, business hours, coupons, and even a local map that highlights your location. The National Whois a large databases that stores registered users or assignees of an Internet resource, such as a domain name. An SSL offers encryption many people are familiar with during on-line banking or a shopping website. Google highly suggest each website listed with their search engine offer this to protect the Search Engine audience form possible cyber attacks. Affordable Custom Web Design and Graphics. Our service area is primarily in Texas although our skills have proven to be useful throughout the United States. Our web design business is located in Burleson within near proximity of Mansfield, Arlington, Aledo, Granbury, Fort Worth and surrounding metroplex. A web design specialist will be happy to visit with you to discuss your business concept and web design expectations.